Posted by Carolyn Burns Bass in chick lit, fiction, novelography. Fiction is made of lies sprinkled with truth. Or is it made of truth written as lies? Either way, some novels are referred to as veiled autobiography, or as #litchat has tagged them, novelography. Why do some writers couch their life stories in fiction, rather than memoir? What about memoirs later exposed as fiction? This week in #litchat we’re discussing memoir masquerading as fiction. Joining us on Friday, May 20, is Dana Precious, author of Born Under a Lucky Moon (William Morrow). A debut novel released in February, Precious admits much of the storyline is derived from her real life. 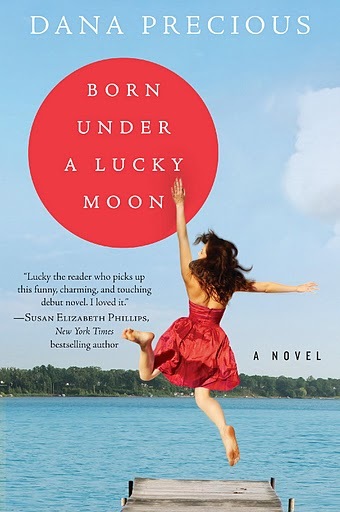 Born Under a Lucky Moon is the tale of two very important (but distant) years in the lives of Hollywood studio executive Jeannie Thompson and her colorful family members to whom zany things just seem to happen. From the Great Lakes of Michigan to Los Angeles and back again, it is a story of unexpected marriage proposals, surprise marriages, a renegade granny, a sprinkler system cursed by the gods, and myriad other factors Jeannie blames for her full-tilt, out-of-control existence. As an advertising executive for a Hollywood studio, Precious draws the line about the reality of much of the Hollywood hijinks occurring in the storyline. Follow Dana Precious on Twitter: @danaprecious.